Thank you so much for your kind comments on my last post! I promise not to post only baby-related things from now on, but I’m sure there will be a burst of very cute tiny clothes soon! My new machine should help me out with that too, especially since I’ll be using a lot of very soft knit fabrics. It’s a Bernina L220 cover stitch, and it’s a real beauty. 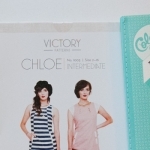 A cover stitch machine that doesn’t make me want to pull my hair out? Yes, thank you, I’ll take 3 dozen, please. I’ve had this machine for a few months now. I am so happy with it! I have used many cover stitch machines over the years, and this is by far my favorite one I’ve come across. 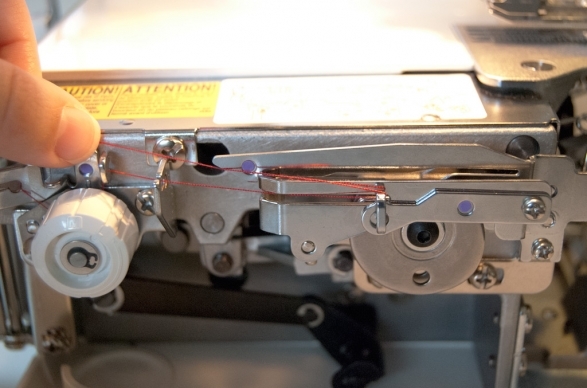 Like most cover stitch machines, there aren’t lots of bells and whistles to go along with it. It has a few simple functions which it does well each time I use it, and that makes me a happy camper. 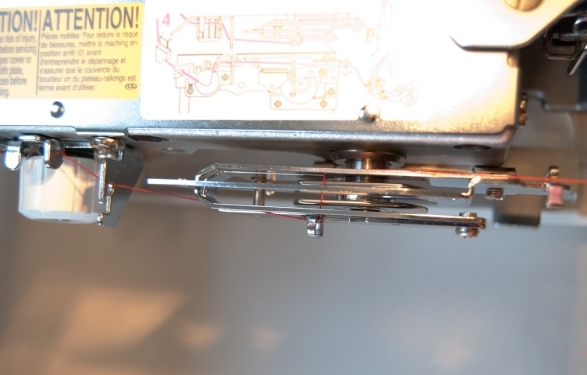 This machine features 3 different needle positions, and can make a 4-thread cover stitch (uses all 3 needles), a wide 3-thread cover stitch, a narrow 3-thread cover stitch and a 2-thread chainstitch. It has easy-to-adjust tension knobs, a differential feed feature and is easy to thread. With the threading, there is a unique sequence with the lower looper. I was overly confident when I brought the machine home and went ahead and pulled all of the loose threads out of it. It turns out that one section of the lower looper thread really stumped me! The manual illustrations and the diagram on the machine itself had a very odd way of telling you to thread a certain section, so I thought I’d help with that here. When you reach this arm on the lower looper thread guides, the first thing you must do is pull your thread thru the small hook guide. Then, you will bring the thread back over this guide, and wrap it under the long finger on the machine. You can then pull your thread under the finger and head for the next hook guide. The illustrations show a dotted line for this part, which wasn’t helpful. I eventually got it though, and if you’d like to see a video of this, Bernina has a guide for threading this machine on Youtube. 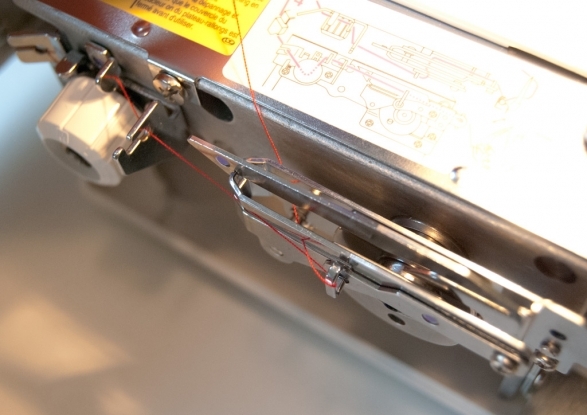 Many cover stitch machines thread their loopers from the right side of the machine. The L220 threads from the left side. 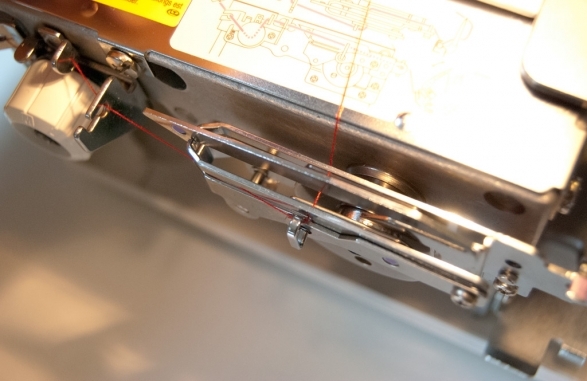 There is an easy looper auto-threader that pulls down so that you can thread the entire looper without struggling. The biggest test for a coverstitch machine is to test it out in different weights and thickness of fabrics to see if it skips stitches. So far, I haven’t found a combination that causes trouble for this machine. On my last cover stitch, the Brother 2340CV, this was a constant problem. 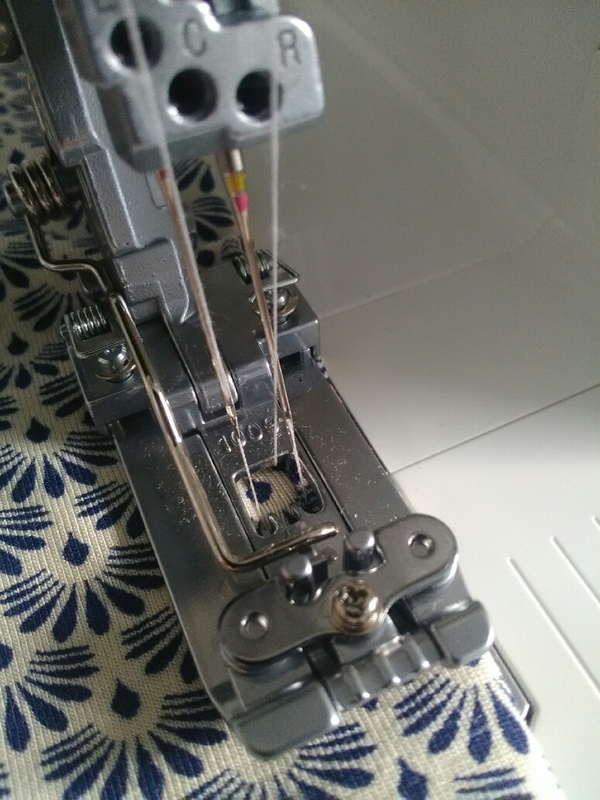 While I was in the middle of stitching, the tension dials would slowly loosen and most of the time I wouldn’t catch it until I turned my work over and saw many places where the looper thread didn’t connect with the needles. It was really frustrating! Using all different types of thread, adjusting the tensions and foot pressure and trying different gauges and types of needles didn’t help either. There were many fists shaken and words spat at that machine! I pushed this machine really hard around Christmas time. I made my dad a cardigan (out of the same pattern I use for myself) out of an extremely thick knit fleece. It was the kind of fabric that North Face would use on a heavier sweatshirt, and in a few places, this machine had to stitch over SIX layers of that fabric. I was reeeeeaaally nervous. The last thing I wanted to do was make my new machine angry! But nope, she handled it like the pro she is, and barely flinched. I was relieved, because my Brother could never make it over those areas when I sewed my own cardigans. One awesome feature the helps with this is the presser foot. This foot is made out of three different spring-loaded sections, so it can ride up over bulky seams and not lose foot pressure. I really like to serge down my seam allowances using a cover stitch, so this foot helps ensure a beautiful stitch every time. Plus, the fabric in that photo? That’s this machine only sewing on three layers. It can really handle a lot! So, back to the skipped stitch test. 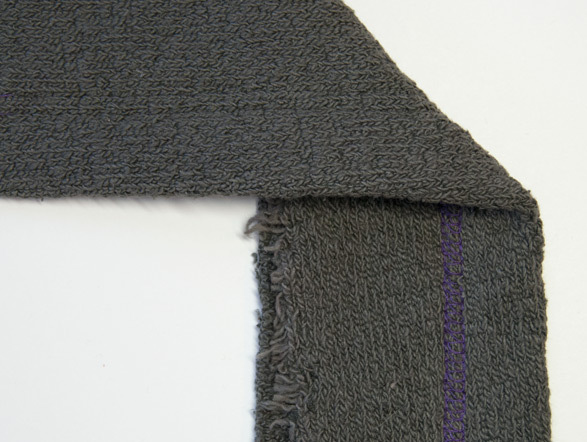 Most coverstitch machines have a very hard time creating a flat, non-skipped stitch on a tissue weight knit. My last machine just couldn’t do it. I loosened the tensions a bit, sprayed some starch on the knit, and fed it into the machine. Would you look at that? It’s the tiniest bit wavy because I didn’t have the edge pressed or pinned and I didn’t hold it flat very well. But I’m still pleased with it! The last example is where I folded the fabric over on itself and used the foot’s spring-loaded feature to sit half-on, half-off the fabric edge. Still a beautiful stitch! Sorry I didn’t use white thread. I should have switched it out for you! I don’t have a photo of the chainstitching, but it does a really nice job of that (if you couldn’t have guessed). I most often use the chainstitch for basting together muslins. It’s much quicker to take apart than a basting stitch on a sewing machine. This machine also has an interesting way of releasing the threads, which I may save for another post. Are any of you curious about the best way to end your cover stitching? Do you have any questions about this machine? This entry was posted in General, How to Sew and tagged Bernina, serging, sewing on June 18, 2014 by Amy Alan. It’s really amazing. I like it so much! Do you ever use stabilizer on the hems before you coverstitch them? I’ve read a few other blogs where they use stitch witchery or some wash-away stabilizer on knit fabrics & I don’t remember it ever being covered when I was at school. That’s just fine! 🙂 I’m happy to help. I don’t use stabilizers on hems, but that’s mostly because I’m lazy. I know that there are times when it would probably help, especially using a knit fusible stabilizer on a really crazy stretchy knit fabric, but I am so forgetful when I’m at the fabric store that I never remember to pick any up. I should probably order some! I have some knit fusible stabilizer in my stash (that I’ve had since college) I’d use it for interfacing, but I rarely make anything in knit that needs an interfacing. I rarely make a knit that needs to be stabilized either. I’m used to sewing non-stabilized knits from my manufacturing days, so stabilizers feel fussy to me. Thanks so much for this helpful review! I have heard and read lots of great things about Bernina sewing machines and it’s nice to know their coverlock machines are also user friendly workhorses! You’re welcome! I’m just wish it hadn’t taken me so long to write it up! It really is a fantastic machine though. I’m glad that I waited until this model came out, as their previous model only had two needles and you couldn’t change the needle positions to make a narrow cover stitch. Sounds like a winner! I have an Elna 444 coverstitch and I like it a lot, but did have an issue with skipped stitches on a heavy sweatshirt knit, and tried everything to get it to work-frustrating! I am curious about the best way to end stitches…I pretty much pull it out towards the back, pull all the threads to the back side and tie them in a knot. I keep wondering if there is a better or easier way to do it. That’s what used to with cover stitch machines- skipped stitches. Especially on thick knits, it can be a real problem. I’m so happy this machine is making it thru everything I give it! I will put a future post on ending cover stitching on my to-do list. I was so excited to see your post on the new L 220! I ordered the L 220 a couple of weeks ago and can’t wait to get it. I fairly new to cover hemming and would love to read more about your machine and techniques. Thanks! How fun! You are going to love the L220. It is a wonderful machine to add to your sewing room. I will be sure to add more cover stitching tips and tricks in the future! Thanks for this really thorough review, it’s so useful! I’m looking into getting a cover lock machine and this model is top of my list so far. And yes I am curious about the best way to end overstitching! I’m glad it’s at the top of your list. You won’t regret it if you go with it! I am so happy every time I get to use this machine. It’s so nice to not have to fight with it, like I did with my Brother model. Hi Amy! Do you happen to have any cover stitch tutorials on your blog or happen to know of any good cover stitch tutorials online? I have a Janome CoverPro and the machine itself is wonderful…. the operator, not so much! LOL. I have the hardest time keeping the edge of the looper inline with the edge of the hem. The stitching on the top looks great but then when I flip the project over the underside is all wonky and not in line with the hem and I usually end up ripping it out. I just can’t seem to get it right. Hi, Stewart! Cover stitch tutorials are on my to-blog-about list! 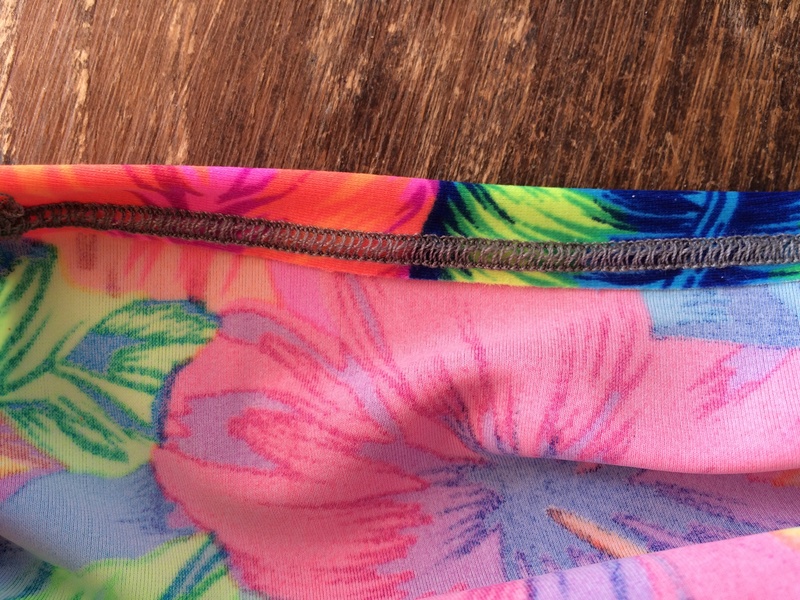 Yes, there are tips to help keep your stitch lined up with your fabric edge. Hopefully I’ll get some photos taken and a post up soon! Hello, guess what I got for christmas? 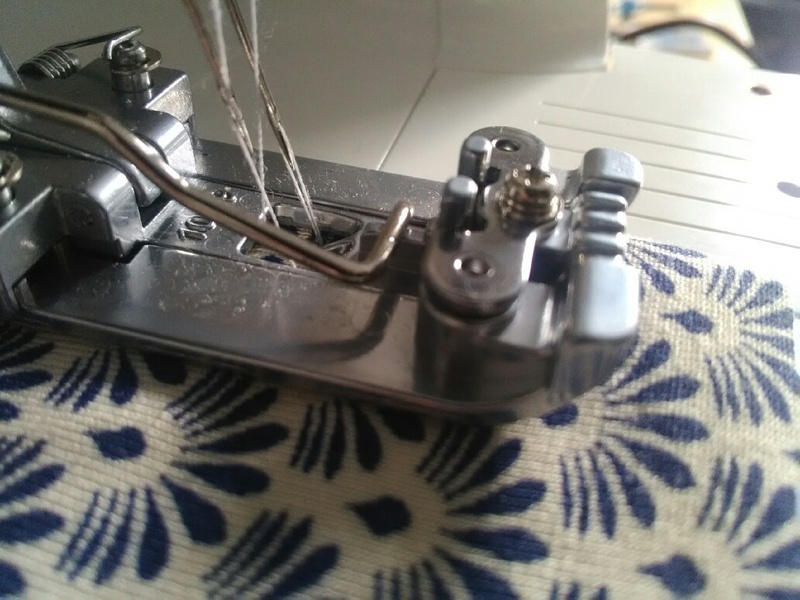 I am having huge problems with it though- in order to stop the left hand needle looping on the reverse of the work, it needs me to use tension 8 or 9. It also doesn’t seem to like overlocker thread (those small spools of thread that are MUCH cheaper). It will only function using very expensive Gütermann thread. If I use anything else the right and centre threads snap. Which thread do you use with it? My old Huskylock 905 uses the small spools and is fine. But it doesn’t coverstitch. If you have any ideas I’d really appreciate your help. Awesome! The L220 is a great machine. There are two things I would have you check for. It sounds to me like your left needle may be dull, or not inserted up into the machine high enough. I would replace the needle to rule it out as a cause of the issue. The second thing you should check is that your threads are inserted in the tension disks. Turn down the tension settings, lift the presser foot and “floss” the thread into the disks. Once you do this you should be able to use the standard tension settings. Why do you say it doesn’t like overlocker thread? Is this because it’s often breaking, or because it’s looping? 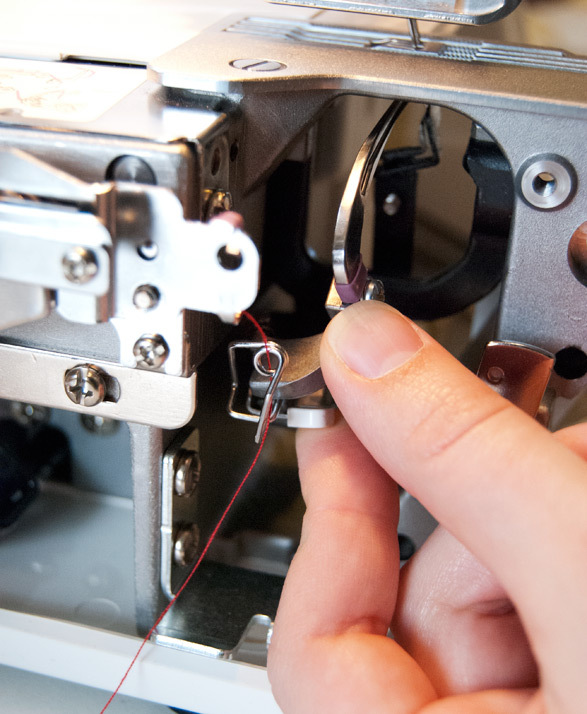 Once you check your needle sharpness, needle height and thread position, make another stitch sample and see if that takes care of your issues so that you can once again try the overlock thread. One thing to note about the thread though is that every machine performs better with a higher quality thread. If you’re talking about the MUCH cheaper thread (I know there are some $1 spools out there), that thread will cause issues for you because it is poorly milled and usually of a inconsistent thickness. Higher quality threads perform better in your machine, which saves you the time of having to rip stitches! I’m so very close to making a purchase of the 220. Could you tell me if it has an “open arm”? No, I would not say that it has an “open arm” or free arm. However, I have never found that to be a necessary machine feature. If you plan on cover stitching in the middle of a large project, then you may need that space. Otherwise, it is quite capable of handling deep hems and cuffs. Thank you, Amy. My concern was finishing sleeve edges and wasn’t sure if it would be awkward without open arm. My existing serger can do cover stitch and has open arm which can be quite convenient. Does the L220 come with a “guide” for the placement of folded edge to help cover stitch over the raw edge perfectly? Or do you know if a guide is available? Thank you so much for yor help. I think your threading instruction are going to be quite valuable! The best way to finish sleeve edges is not to use an open arm. Depending on the sleeve you are sewing, there is a very good chance of stretching out the fabric as you try to take it around the arm in a circle. Instead, turn the sleeve wrong-side-out, and stitch the right side of the fabric by putting the presser foot just inside the sleeve hem edge. Does that make sense? 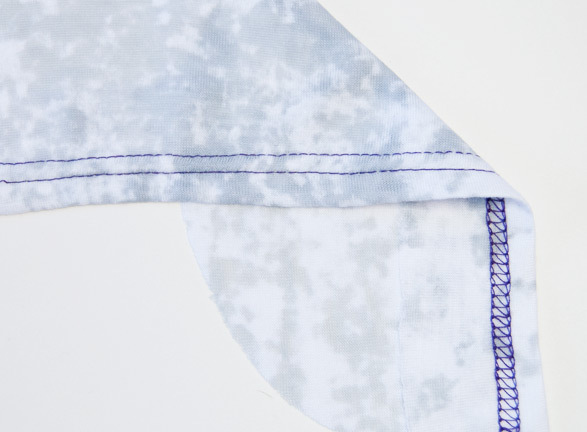 By sewing it this way, you can coverstitch even the tiniest shirt sleeve hems. The L220 does not have guide, but it does have markings on the stitch plate you can use. There may be an available guide as an attachment or accessory, but I’m not sure. You’d have to ask a Bernina dealership. Thanks for all your information. I have put one on order today. what is the coverstitch measurement when using 2 thread coverstitch for the front of the garment? is it 5mm, 3/6mm, or 4mm? is this machine a 2 needle or 3 needle? The width of the stitch you decide to use on the front of a garment when coverstitching is up to you. 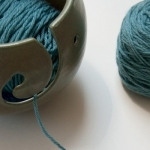 Some manufacturers use a narrower stitch, but most use a 5mm stitch. 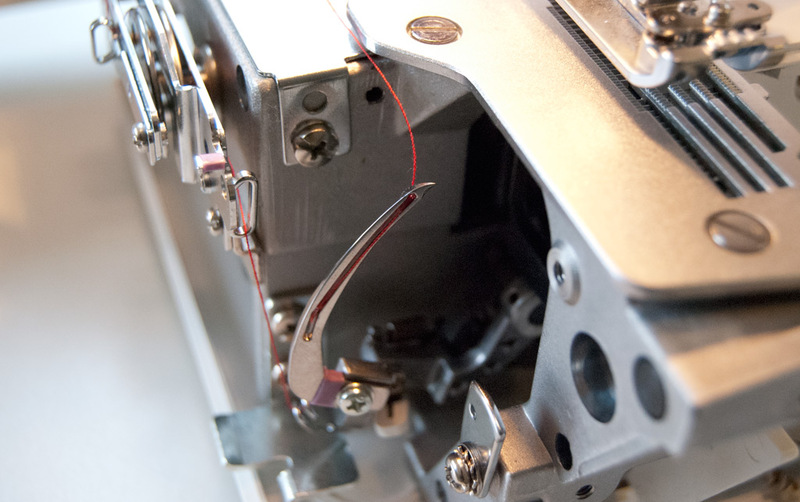 This machine can do either a 3 or 2-thread coverstitch, and these can be either 5mm or 2.5mm in width. If you look up the product brochure online, you can read more about its features. I got the L220 for my Birthday. I know it has an optional chain stitch presser foot, have you used it and does it add any benefit to the chain stitching process? Also, I cannot tell from the Bernina website if the hem stitch guide will fit the L 220, but the L220 has places for something to screw into the platform and a hem stitch guide would be a great help. I have not used the chain stitch presser foot. I’ve found that I get great results with the standard foot that comes with the machine, so I haven’t purchased one. Also, I would ask a Bernina dealer about using a hem stitch guide on the machine. I’m not sure if it would fit on the machine, but I believe it is likely that it would, considering the holes that you mentioned. Hi Amy I just wanted to comment that I recently purchased the Bernina Cover Hem Guide and it does not fit the L220. My dealer has been most helpful sending photos I took of the ill fitting hem guide on the machine to Bernina Australia. They have informed my dealer and I that Bernina are aware of this problem and Bernina Switzerland are currently working on a solution. So just need to wait and see. Also I love my L220. Thank you sharing that information, Margaret! That’s very helpful to know. I hope they are able to fix the issue soon! I saw a tip somewhere to use a block of post-it notes as a guide – just remove the bottom paper and stick it on where you need it. Might be worth a try. Hi Amy, I’m looking at sergers and thinking I want to coverstitch, too. Would you recommend buying the Bernina 1150 and 220, or the 1300? My goal is to make professional looking clothing for myself. I would recommend buying the 1150 and the 220. The 1300 is a nice machine, but if you are planning on sewing lots of knits (and let’s be honest, once you make a nice t-shirt that fits well, it’s hard to ever buy one ever again), it is really nice to not have to switch a serger back and forth between serging and coverstitching. If you will sew mostly wovens with the occasional knit, then the 1300 would be fine. But having the coverstitch machine all set up and ready to go so you can bust right through when sewing with knits is AWESOME. Does the Bernina serge over a serged seam? I returned my Janome coverstitch because it wouldn’t feed the fabric if I serged the seams then tried to coverstitch over that serged seam on the right side. Hope that makes sense. Yes, it serges over serged seams beautifully, even thick ones. You may need to set the looper tension on L (loose) if the seam is particularly thick, so that it can catch the needle threads nicely, but it’s always stitched very well for me. I just reread my question and think I phrased it wrong. With the Janome I attempted to coverstitch down the length of the serge seam. I guess it would be called top stitching, folding the serged part over to the right of the seam and coverstitching down the entire length. The Janome refused to feed the fabric unless the seam was made with a 1/2 allowance with my sewing machine rather than the serger. That’s really interesting that the Janome wouldn’t cover stitch on top of the serged seam allowance. It could have been that the Janome didn’t have enough foot pressure to be able to sew over uneven bulk. What I like about the L220 is that the presser foot is hinged. This helps it sew over uneven thicknesses of fabric, because one half of the foot can be sitting higher than the other, and still sew perfectly. 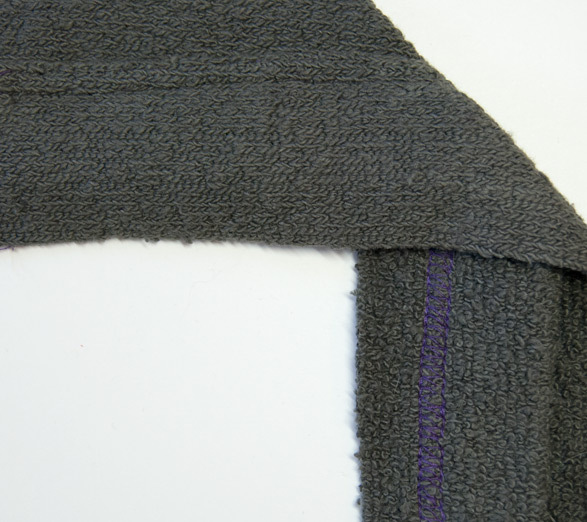 I used it when topstitching down seam allowance on a cardigan I made for my dad (out of heavy sportswear knit with a fleece backing) and it did a phenomenal job, even over that super bulky seam allowance. I usually use a 1/4″ seam allowance on the serger, and this machine was able to cover stitch over that on the right side of the fabric beautifully. I just got an L220 and I can’t wait to get started on a classic male cardigan. Would you share the pattern number you like? thx! I have a whole post up on my favorite cardigan! http://reallyhandmade.com/a-classic-cardigan/ It’s the McCalls M6803. I’m not sure if this one is still in print, but if so, snag it! Hi Amy, I too own the L220, and absolutely love it! Thank you for your review. It has been extremely helpful. Now… I’m wondering if you could recommend a vendor for the heavy-weight cotton sweater knit fabric? I’m not having any luck finding it, and would like to make myself some sweaters. I wish I could, Antoinette! I have a particularly hard time finding it myself, and one of my favorite suppliers is going out of business at the end of December. Boo! I do believe that Bolt Fabric here in Portland, Oregon has it, and they will ship if you call them and ask and order some swatches or yardage. That’s where I found 2 of my last pieces of heavy-weight cotton knit. I still wear those sweaters all the time too. Good luck! Hello, I’m wondering of you still love your machine and recommend it? I hate my janome coverpro skipped stitches and looking to sell and get something else. I do still love and recommend it! I’m sorry your coverpro is giving you fits. Skipped stitches on a coverstitch machine is the worst, since it all unravels. 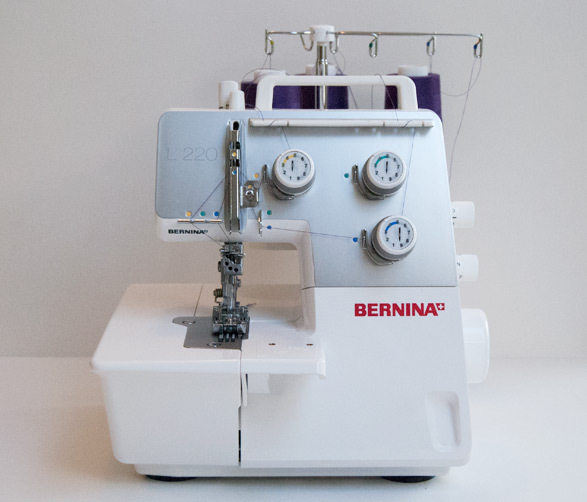 Go try out the L220 at a local Bernina dealership! It is a wonderful machine. Thank you for this post! It really helped me with my new L220! I have a question and I’m hoping you can help (I am fairly new to sewing, so I need as much help as can be!). 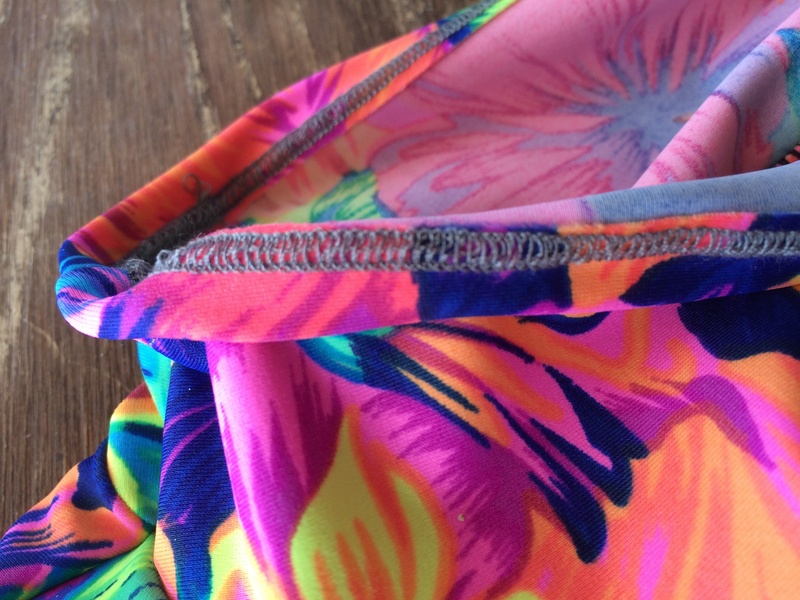 I am hemming mostly swimwear (nylon, spandex) with my coverstitch. The inside of the hems look a bit bulking and not as clean as professional hems. The outside/right side looks great though. Any suggestions on best settings and tension for hemming spandex? Thanks in advance! Great! I’m glad it was helpful! Can you better describe what you mean by “the inside hems looks a bit bulky”? Do you mean that your stitch is not laying flat? Is the thread puffed up? What kind of thread are you using, and how does the back of the stitch look when the hem is stretched? I would try three different things individually on swatches of this fabric, and see what you like best. First, you could increase your stitch length. Increasing the stitch length puts more tension on the stitch, and will eliminate some of the excess thread. On the second swatch, try increasing the tension on your chain stitch looper, which will put less thread in the stitch and give you a smoother finished look. Third, you could use Stretch serger thread in your looper. This thread will not only expand and move more with the fabric, but it sews like elastic and pulls back into place when you sew with it, making a smoother back of the stitch. 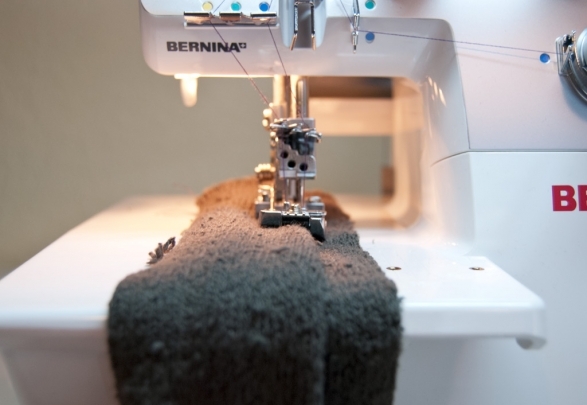 When you are sewing your hems, do you have your differential feed engaged? If your fabric is stretching out too much as you sew it, you may actually be making your stitches closer together than you really want to on your finished product, resulting in this effect when the fabric is not stretched. This look isn’t exactly a bad thing when you are using non-stretch thread, since you’re giving the hem more room to stretch without popping and breaking threads. But for that really professional finish, I would use the Stretch thread in the looper because it will not only lay flat, but it will have the most give for stretching with wear. Amy, you’re amazing, thank you so much for this advice. I do have stretch thread, was just afraid to try it! Will put that in the looper and give all of these a try and see how things improve. Thanks again!! If you’re having issues sewing a certain kind of garment or fabric across multiple machines, the first things to look at would be the stretch of the fabric compared to your needle, thread and tension choices. I don’t know what issues you have had so I can’t really offer suggestions as to what you could offer, or know if the L220 would take care of those issues for you. If you can test out your project on the L220, then that is what I would recommend. Then you can see if you feel like this machine creates a better stitch for you on the swimsuit fabric. Hi Amy! Thank you so much for such an informative blog post! I have both of your Craftsy classes and I love them! I hope you will continue making many more 🙂 I just bought a Bernina L220 and am having a little bit of trouble. My right needle thread kept breaking during my test runs, and when I looked closer, I noticed that the right needle thread was doing something really strange. I will add a picture to illustrate. I was hoping you might know what is going on. I have changed the needles several times (I’m using stretch needles) and I am sewing on rayon spandex with polyester thread. I also rethreaded the machine several times (although I am new to this machine, so I may be making a mistake along the way…) Any suggestions would be of great assistance! Hi there! I’m sorry to say that I can’t be of much help in a blog post comment section. There are lots of machine variables that could be causing this, but the most likely culprit is your needle. There are two things I would do. First, make sure that your needle is actually up in the needle clamp as high as possible. You may need to loosen all of the needle set screws in order to really get it up in there. Secondly, I would switch to a needle with a Universal needle tip, and make sure it is of the correct needle system (130/705). If both of those are correct, then you could address the threading order and perhaps tensions. Hi! Thank you so much for your fast reply! I changed my needle from a ball point needle to a universal one and that did the trick. Thank you so much!!! I finished up four projects with my new coverstitch machine and I couldn’t be happier!